How to Secure a Forklift on to a Transporter. 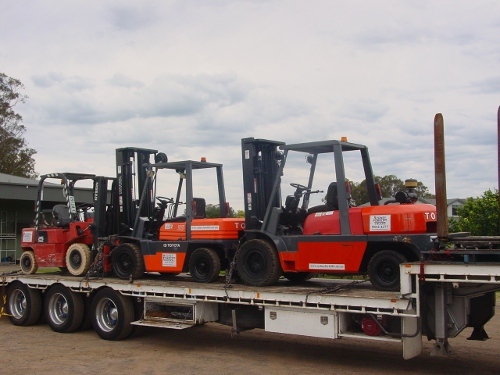 The need to transport forklifts to a new location arises in many businesses from time to time. Whether it is to move to a new site or perhaps bring to the premises following a purchase, it is important that the machine is transported securely. By taking your time and properly securing the forklift to the transporter, potentially fatal accidents can be easily avoided. 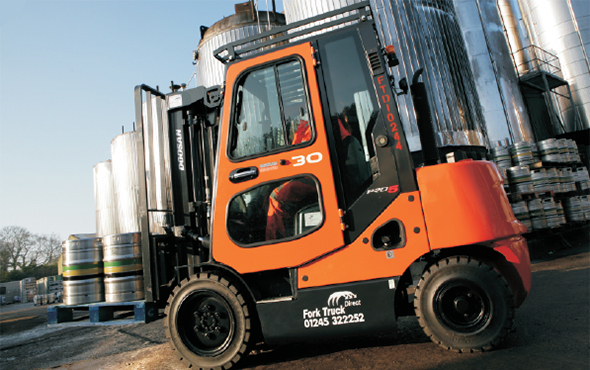 The first step is to ensure that the transporter is correctly prepared for moving the forklift. The transporter should be in a good roadworthy condition with chocked wheels to prevent the vehicle from rolling. If a trailer is being used to move the forklift, a nose jack will be needed under the front of the trailer. It should be correctly adjusted so that it sits within an inch of the trailer, this will ensure the trailer is not in danger of tipping forward. It is a good idea to check that the person driving the vehicle is appropriately insured and road legal before undertaking any movements. The next step is loading the forklift safely on to the transporter. To protect the driver from the forks it should be reversed onto the towing vehicle. This will mean that should any accident occur, the forks will not be forced through into the driver’s cabin area. The forks should then be lowered to the ground and tilted forwards just a few inches. Strong wooden blocks should then be positioned behind the wheels of the forklift. These are then secured to the wooden base of the transporter so that they fit securely against the edge of the tires. The forklift’s fuel supply needs to be completely shut off. If it is a petrol or diesel machine, the fuel tank needs to be secured so that the fuel is unable to move around during the transportation journey. Next, you should completely disconnect the battery terminal as there is a possibility of arcing, which will start the engine during transportation. Before leaving for your destination you should double check all the above steps have been carried out correctly and then begin to secure the forklift. The machine can be secured to the transporter using a variety of purpose-designed chains and straps. They will ensure that the forklift is secured to the edges of the transporter so that it cannot move. A great tip is to secure four anchor points, with one at each corner of the forklift as this will provide extra security against movement. Hopefully, these points will answer any queries you may have about the transportation of a forklift. If you do have any queries feel free to contact us as we will be happy to advise. It is important that before attempting any transportation the forklift manual is carefully reviewed. Many manufacturers have very specific instructions which need to be followed to ensure their machines are transported safely.